How to Avoid Flat Tires is an issue all cyclists and triathletes deal with, click to see the Gatorskin Tires Review which will drastically reduce how many flat tires you get biking. I’ll give you some tips on which tires you can use, and what you’re going to have to give up to make sure that you’re avoiding as many flats as possible in those rough conditions. 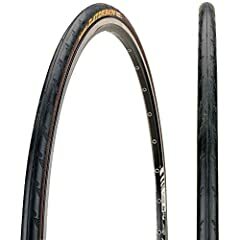 I had been riding these Vittoria Open Corsa CX IIIs for a couple of seasons so they were coming to the end of their lifespan, so I decided that I would retire these and because winter was coming up and the roads would be pretty gnarly I would upgrade to a fairly flat resistant tire. 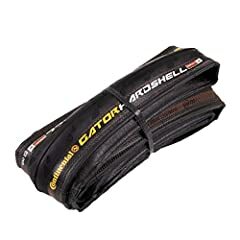 This is the Gatorskin Duraskin non-foldable tire, it took me one ride to realize how much ride quality I had actually sacrificed coming from those Vittorias. So I started doing a little bit of research on why these flat resistant tires are so poor in their ride quality, and what you can expect if you are going to go to a tire that is dedicated to those bad conditions. If you make a tire either faster or more durable you’re going to sacrifice grip and a fair bit of ride quality. A Vittoria Open Corsa tire weighs about 235 grams and the Gatorskin weighs about 290 grams. A difference of 55 grams, you might think that that’s not a big deal but testing actually shows that somewhere around 15 times the actual weight is the rolling resistance that’s put on to the tire. So that fifty five grams is actually an additional 825 grams of rolling resistance, 1.81 pounds. 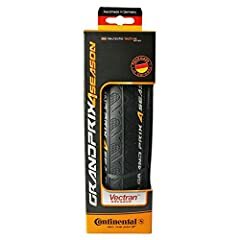 When you can spend the same amount on both of these tires and have a net rolling resistance effect of 1.81 less pounds with a Vittoria Corsa or a typical road tire; you’re going to notice a fair bit of ride quality difference when you go with a Gatorskin. If you want to talk about watts of rolling resistance, anywhere in between 100 and 120 psi, which most people are going to roll their bike tires at, a Vittoria Open Corsa is going to have about 13 to 13.6 watts of rolling resistance. The Gatorskin has 19.3 or 20.2 watts of rolling resistance. So we’re talking about 60% more rolling resistance in the Gatorskin over a Vittoria Corsa. With some people spending hundreds of dollars on aero helmets, and aero shoes and aero pedals to save seven watts of rolling resistance. And just by choosing a different tire you can get seven watts of rolling resistance gain. One of the biggest and most serious differences that I saw between these two tires was the control that I had with the bike. So I don’t really have any stats to give you on the grip between these two tires but I’ll certainly say that anecdotally, I’ll say that this tire is not nearly as safe as a lot of the other tires out there. If you’re strictly looking for a tire that is more flat resistant than the other tires out there and you’re not worried racing, and you just want a big burly tire that you’re not going to have to worry about flats with the Gatorskin is a good option because we do have some stats that show the Gatorskin is about 50% more flat resistant than the Vittoria tire. And Continental themselves say that the Gatorskin is more suited for grand touring and touring, not so much group riding. But just know that you’re probably going to give up a fair bit of ride quality and as soon as you start riding in groups or you start riding a little bit faster, taking faster turns, you should probably be getting into a safer, more supple, more grippy, better suited tire where you have more control over the bike. So there you have it folks, the Gatorskin is not a terrible tire. Good friends of mine absolutely swear by these. It’s just not a very good trade off for me for the vast majority of my rides. Use it sparingly, in winter riding, in rough conditions, be extra careful with it. And just understand that it’s not going to be the same feel as a typical racing tire. Cx and Gator skin in one video, 2 years ago. Compared to my continental sport.I cant imagine using gatorskin on both wheels lol. To be fair, Gatorskins have a good amount of grip on them. I haven’t had much trouble from them at all when banking tight corners. Then again, I’m not a racer, so I can’t speak for how they perform in a race. I can speak for how they perform in cornering. I usually lower my center of gravity when going around the corners, so I have more confidence while using them. I use Gatorskins on my “work hack”…had them on there for about 2 yrs now and no punctures, I love these tyres for town riding and general getting about on but id never race on them. 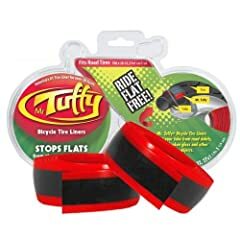 I find them far to sketchy in fast riding and unbelievably heavy and they scrub the speed of you as soon as you rest up/stop spinning on a flat to grab a bottle. I use Vittorias on my race bike and they just roll such much better, faster, easier. Completely agree with you mate, good tyres but not for race day. This is heavily misleading. You say that the biggest factor in rolling resistance is weight when that’s not completely true. Also you mention weight of course being heavier on the gator skins than the corsa, yes that’s true but only for the wire bead version of the gator skin. Looking at the folding gators vs the corsa its a lot closer in weight. The open corsa which Vittoria no longer makes is in a 23 mm size 215 grams and the folding gator skin is 220 grams, So the point of weight is moot. If you’d really want the fastest clincher made then I’d recommend the Michelin power competition, it’s light fast and grippy. Also it has the lowest rolling resistance of any tubed clincher acoording to several independent studies. When its not raining I’m riding. I have 28s on a BMC hybrid. I will never use anything but Gators. Peace from Sanibel Island Florida. So with rolling resistance, how does it work when you’re up to speed in terms of momentum? Surely that helps going downhill? Brilliant – it took me 7 reviews before I got the answer I needed from your review. Thanks! I’m not meaning to troll your video,but did you consult a physicist on your moment of inertia or rotational mass calculations? The mass seems a bit unspecific as to what you are trying to calculate and over simplifies the complex and rigorous formulas and solutions. Thanks. I don’t like riding with a**holes anyway. I’m going with the gator skin. Conti’s ROCK! my tire of choice over all others. Just for my clarification… you’re not saying these are a bad idea right? You’re just saying that for durability they’re good but they’ll potentially slow you down and don’t handle the best? I’m pretty new to triathlon and on a tight budget. I want to get something that will last a long time but help my bike improve. What would you recommend? What a bell end. People buying gator skins do so to allow them to commute without getting stuck on the feckin roadside 1 hour from work 30 minutes from an meeting with their boss. Fair trade off. Changing a tyre and my second puncture of the day at 6am is not amusing. Rolling resistance appears only when accelerating. It doesnt slow you down when at speed.